Not sure what this is showing, but you can bet it's enough to ruin your day. The camouflage in the form of tree branches really blends these shooters into their environment, especially matched with the red shirt. And I wouldn't worry about any recoil that might result, just keep riding. So I'm thinking I've only got a shot left of whiskey last night when I open the cabinet and see there's a new 12-year old bottle sitting front and center. Life's little surprises get me every time. Good luck out there - give 'em hell before they give it to you. Looks like fun. 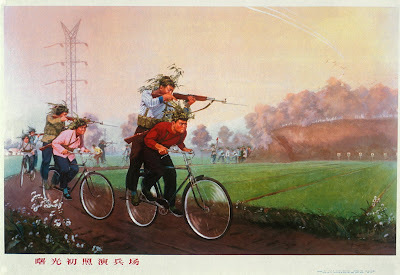 The Chinese characters below the image translate to something like "A sunny morning at the shooting range"
Cool image from the days before helmets and gun safety.